Kennedy Space Center, Florida. September 11, 2014 – NASA is making steady progress on its Orion spacecraft, completing several milestones this week at NASA’s Kennedy Space Center in Florida in preparation for the capsule’s first trip to space in December. Engineers finished building the Orion crew module, attached it and the already-completed service module to the adapter that will join Orion to its rocket and transported the spacecraft to a new facility for fueling. 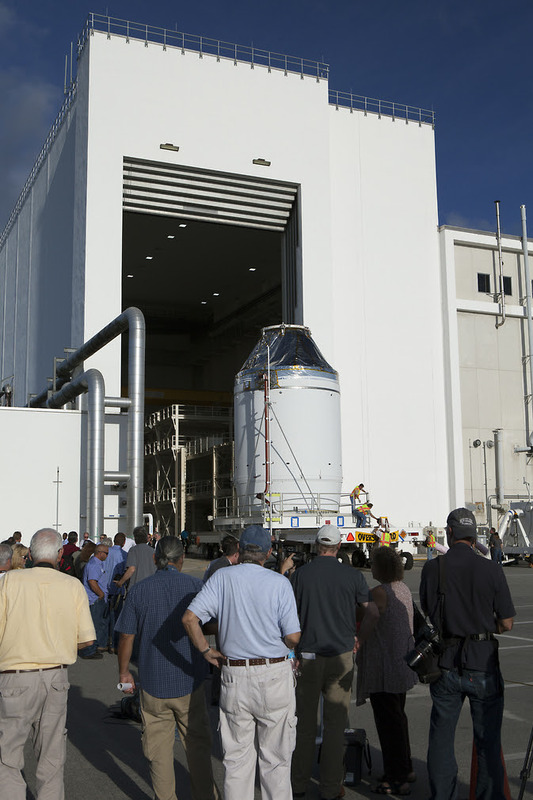 Finishing the Orion crew module marks the completion of all major components of the spacecraft. The other two major elements — the inert service module and the launch abort system — were completed in January and December, respectively. The crew module was attached to the service module in June to allow for testing before the finishing touches were put on the crew module. The adapter that will connect Orion to the United Launch Alliance (ULA) Delta IV Heavy rocket was built by NASA’s Marshall Space Flight Center in Huntsville, Alabama. It is being tested for use on the agency’s Space Launch System rocket for future deep space missions. NASA, Orion’s prime contractor Lockheed Martin, and ULA managers oversaw the move of the spacecraft Thursday from the Neil Armstrong Operations and Checkout Building to the Payload Hazardous Servicing Facility at Kennedy, where it will be fueled with ammonia and hyper-propellants for its flight test. Once fueling is complete, the launch abort system will be attached. At that point, the spacecraft will be complete and ready to stack on the Delta IV Heavy. Orion is being built to send humans farther than ever before, including to an asteroid and Mars. Although the spacecraft will be uncrewed during its December flight test, the crew module will be used to transport astronauts safely to and from space on future missions. Orion will provide living quarters for up to 21 days, while longer missions will incorporate an additional habitat to provide extra space. Many of Orion’s critical safety systems will be evaluated during December’s mission, designated Exploration Flight Test-1, when the spacecraft travels about 3,600 miles into space.